I love movement and I love celebrating, thus I always strive to create movement-rich celebrations. For years, I’ve done a movement advent calendar at the end of the year as a thank you to my readers, and as a way of inspiring people to move more in their daily lives. 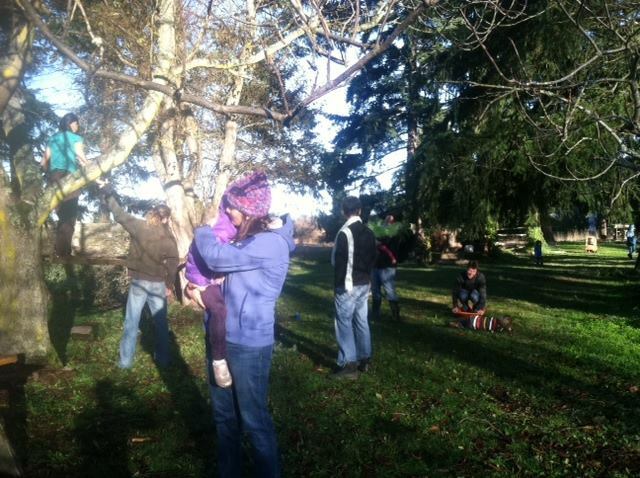 No fancy equipment, just us moving joyfully together during a busy time of year. December is a super-busy time and I've decided I don't want to spend a lot of time on the computer writing things about spending less time on the computer that you then need to spend time on the computer to read. 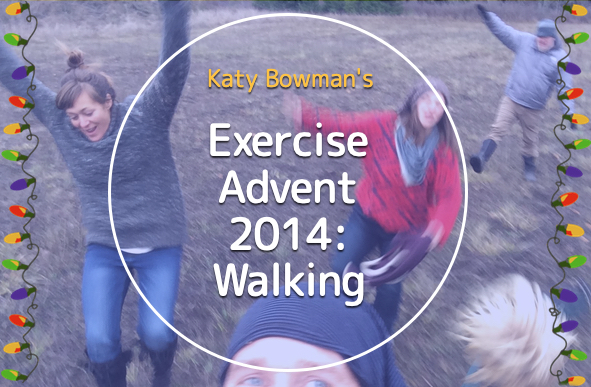 Still, I really enjoy working with you and seeing people collectively become more active, and so this Walking Advent. DAY 1. Load your Rectus Femoris. The psoas is over-blamed for restricted hip extension, when really the iliacus (a muscle between the pelvis and the thighbone) and the rectus femoris (RF, the only one of the four quadricep muscles to run between the pelvis and the shin) are more involved with the hip joint. 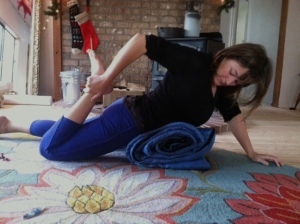 Because the RF passes over two joints--the hip and the knee--it is often blown past in "quad" exercises that don't fix both the pelvis and lower leg.Using a bolster or, as I am here, a rolled-up sleeping bag, prop the top of the pelvis (put your ASIS aka "hip bones" higher up on the roll) while letting your pubic bone fall toward the floor. This will tilt your pelvis posteriorly, simultaneously extending the hip, and displacing one end of the RF. Then, to create tension down the RF, flex the knee as much as you can WITHOUT letting your pubic bone change position; use a strap as necessary. Day 2. Door Jamb Reach. I talk a lot about hanging, but even more important (to a natural load profile) is reaching…farther than the keyboard. Walking truly is a whole-body effort and natural gait requires a certain motion about the shoulder axis—a motion altered by decades of hours at a desk. So. Every time you walk through a door jamb do a pseudo hang or shoulder flexion load. Loop your fingers around and edge (if there is one) and lower your weight towards the floor, doing the bulk of the work with your legs but a smidge of work with your arms. Or, keeping your arms straight, push the chest forward and through your arms. Play around with the position of your elbows (i.e. the rotation of the shoulder). Do they always point away from each other? Try a few with your elbows pointing straight ahead. In the course of a day I walk through at least 100 doorways, which means these little 20-60 second door jam hangs break up my arm geometry with greater frequency than one 15-minute hanging session does. Day 3. Knee Pit Mush. Inspired by the Knee Chew on page 222-223 of Jill Miller’s new book, The Roll Model, I’ve been putting a (tennis or Therapy Ball PLUS) ball in my knee pit to load my upper calf muscle fibers and hamstring tendons. Bending the knee to pin the ball, I circle my ankles, rotate my shank (see video example of shank rotation) and sometimes hook the opposite leg over at the ankle as I'm doing below. Change the position of the ball 3-4 times (more, if you have time) as every position creates a different load. I've been doing this 20 minutes a night, but give yourself at least 5 minutes per leg. Day 4. Straight-leg swing through. When walking, the way your leg swings through to the next step is determined by how much you are using the lateral hip of the non-swinging leg. The less you fire these muscles that list the pelvis (one side of the pelvis moves toward the floor while the other half moves away) the more you are forced to bend the knee on the swing-through and the more bent the knee is when you land on it. Don't believe me? 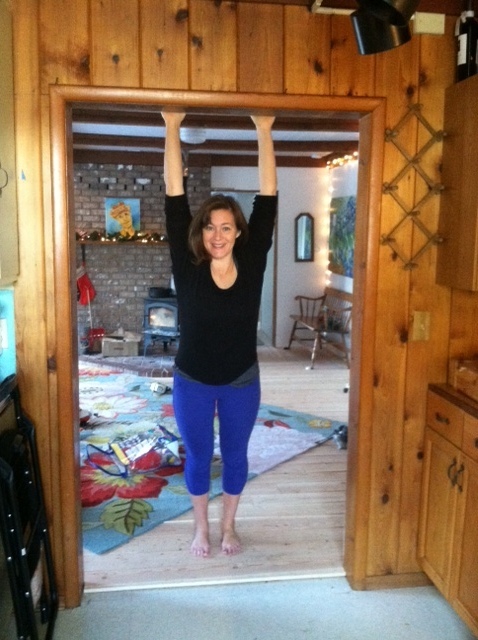 Try it for yourself.Standing on one leg, let your hip relax to the left, letting your right hip bone sink to the floor. Then, without changing the altitude of either hip bone, swing your leg straight forward and back, noticing how much you have to bend (read: shorten) the length of the leg to accommodate the distance between your dropped hip and the ground. 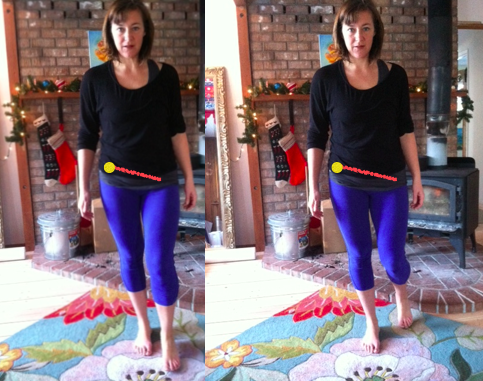 Now try it again, this time pulling your standing leg's hip bone down to the floor (here is a video of this pelvic listing exercise) and practice swinging a straight leg forward and back, to monitor/challenge the endurance of the lateral hip muscles. The purple arrow shows the net action of the muscles running down the outside of the thigh. Work up to swinging a straight leg (lateral hip challenge!) back and forth for three minutes on each leg, alternating legs every minute. Day 5. 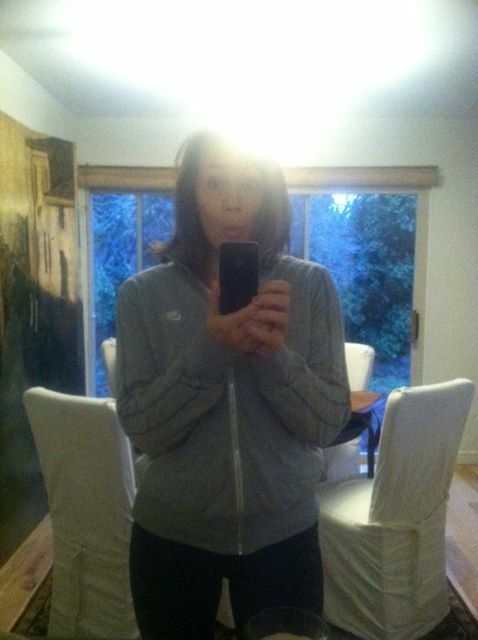 LET THE WORLD BE YOUR (WALKING) MIRROR. When you learn about mindful movement/alignment it's easy to start looking around and finding fault with how OTHER people are moving. Today's task: Use "what you see in others" as a reminder to pay attention to those things in yourself. Thoughts about "how others are moving" are distractions from your own work, which is to be a mindful mover. If you're thinking about them, you're not working on yourself. Day 6. Don't Head Out on a Walk. Are you leaning forward as you walk? How about back bending? I think you might be back-bending while you walk. Take this test to see for yourself. Learn more here. Day 7. Get off the beaten path. For at least 10 minutes today, walk OFF that flat and smooth ground and let your ankle joint complex participate fully. Don’t have wild terrain nearby? Just walk on the stuff right next to the path. Day 9. 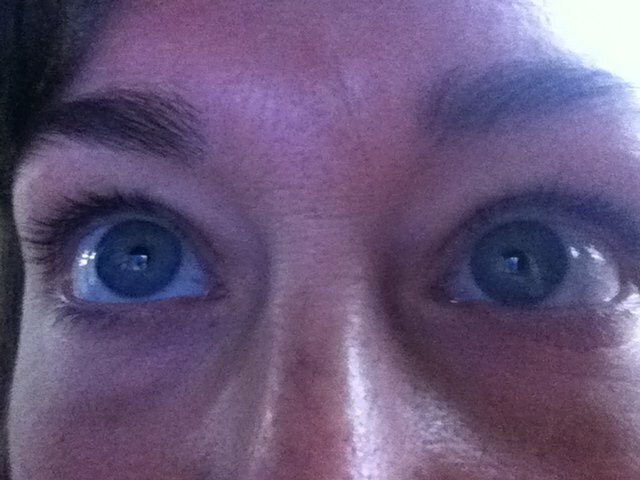 Cross-train your eyes. Without looking away from THESE WORDS, see if you can see items in your surroundings. Your peripheral vision uses different areas of your eye; parts that go unused in the all-day tunnel vision utilized in screen work. Today, pan out while walking and see if you can keep checking in with a wider view of the world. Bonus points for distance-looking now and then (even more unique eye-work!). Day 10. MORE RIB CAGE EXERCISE! Sorry, but your rib thrust is messing with your gait. Try this exercise to see how you do. Day 11. ONE SHOE ON, ONE SHOE OFF. 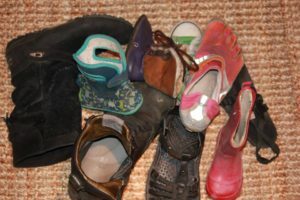 Do your own data collection on the difference in loads to your structure and neurology, by walking (in the house or outside) wearing one "regular" shoe only. Then, put on ONLY one minimal shoe. See how minimally shod is also different than barefoot. Then put on two styles of minimal, one on each foot to feel how they differ. By comparing all these scenarios in real time, you'll get a sense of how the input of the world changes, based on what you put on your feet. Day 12. Take a different path. So, you're going to take a walk today, but do you always head to the same park? Walk out your door and head in the same direction? Familiarity is a breeding ground for a mindless movement. When you've already "been there and done that," you don't need to pay as close attention. Today, TAKE A DIFFERENT PATH. Head right instead of left. Walk on the other side of the road. Think outside your loop. Day 13. No Salsa Hips! Does your pelvis twist when you walk? Tight hip-flexors prevent your stance leg from moving behind you at the hip, which forces the entire pelvis to twist so your body can pass forward to the next step. TODAY: Put your hands on your hips while walking to notice how much your pelvis (read: LOWER BACK) twists to compensate for a lack of hip extension. And read this article! Day 14. Use a "biofeedback" tool. Fill up a mug with your morning drink, and then go and take a 3 min walk, noticing how the "slosh" reveals much about the smoothness of your gait. Lanyards w/tag, or a set of keys on a string worn around the neck also offer excellent insights. Read about a scientific experience on spilled coffee! Day 15. 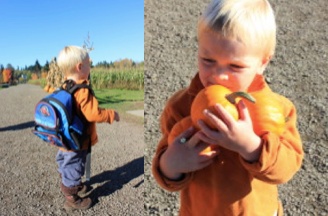 Backpacks and purses are (believe it or not) a technology. Instead of using many different parts of your body to carry stuff, you've been using an unvarying, repetitive muscular action to carry your loot. TODAY: Take 4 things normally in your bag and carry them in your arms for at least a mile to see which parts have been "unemployed" for the sake of convenience. Day 16. Working while you walk. We all need to work and we all need to walk. An EASY SOLUTION is to accomplish work-tasks while moving. TODAY: Check something off your "work" list while walking. That dreaded "a ton of time on hold" call you need to make to change your phone service? Do that while walking. That stack of bills that needs to go out? Walk them to the closest mailbox. We all have little to-dos that we dread because of the wasted time it takes to do them. 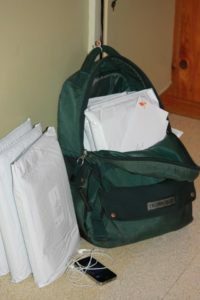 Right now: I'm going to deliver these to the Post Office, do a phone meeting on the way, aaaand take my kids. Day 18. Don't Toe The Line! A "balance beam" gait pattern can be a sign of weak lateral hips. 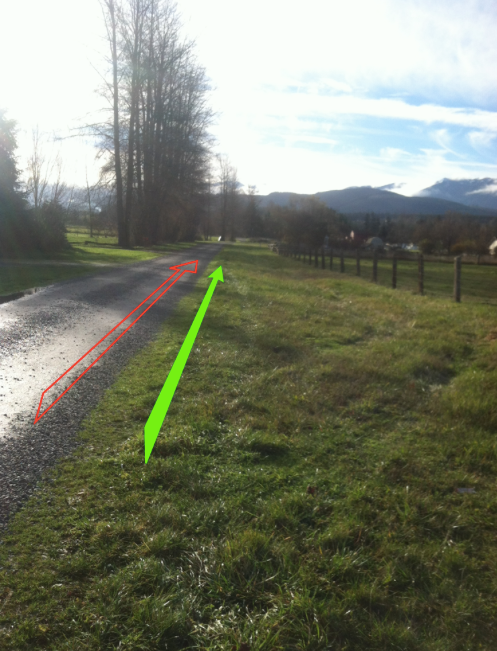 Listing when you walk allows each foot to stay in it's own channel and keeps the hip from being flung to the side. In modern, limited-movement living, wider hips become relatively weaker, which creates that cliche' narrow stance/wiggle-hip walk. Today, check out your foot placement and see if you can widen your "foot channels" a bit (just an inch or two; it takes time to develop hip strength) to get your lateral hip to work more controlling the hip joint with each step. Day 19. HILLS. Walking is a category of nutrient, like "Fat." For this reason, it's important to get the full spectrum of "walking nutrients" which includes going up and down hills. Walking on hills uses different muscles and muscles/joints/levers in different ways than flat-ground walking; you're probably very undernourished in uphill/downhill cell squashing. TODAY: Climb a hill, outside is preferred. But if you've got nothing around, a treadmill (yes, a treadmill!) is a convenient way to get a small portion of "Vitamin H" (you'll be missing all downhill nutrients). Set it to max. incline (12-15%), no faster than 2.8 mph, and no holding on. Think "uphill hike." P.S. "Uphill walking" is also a category! Every percent grade offers a different nutrient--a different cellular squish. Day 20. GET OFF THE COMPUTER. Then go take a walk. Me first. The end. Day 21. 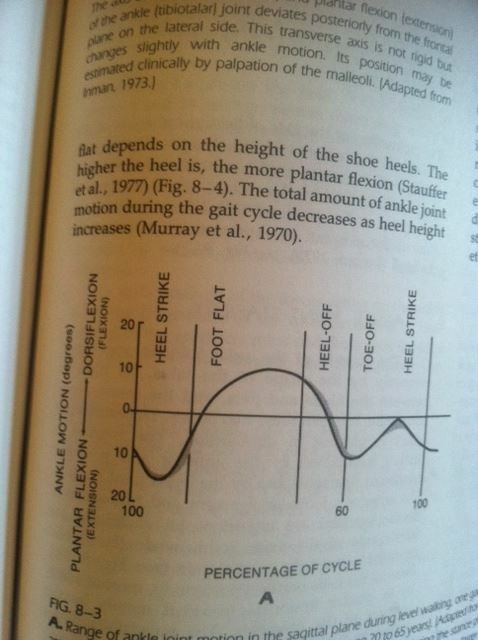 HEEL STRIKE IS POORLY NAMED. "Heel strike" is the point when your heel first makes contact with the ground during a step. "Strike" implies a fast hit with possibly harmful effects, but really the weight of your body should gradually come onto the heel--being controlled by the opposite leg's muscles. When you're "falling-as-walking" then the weight is thrown from one side of the body to the other in a more abrupt exchange--STRIKE! !--taxing the tissues of the heel. 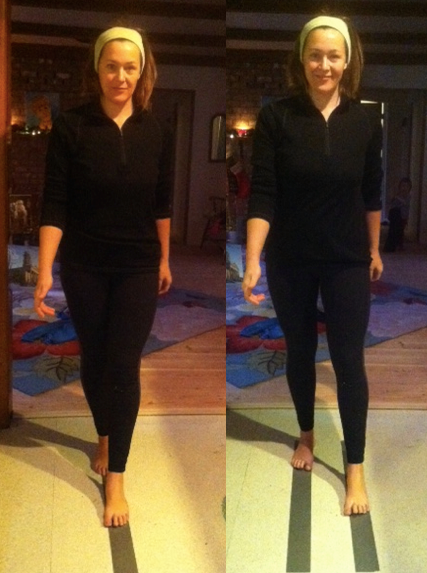 TODAY: See if you can control the weight being placed onto your heel with the "listing" muscles in the opposite leg. 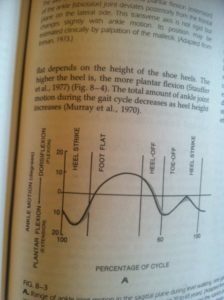 Then try walking WITHOUT control and see how the loads to the heel differ. Day 22. When upright, your whole-body Center of Mass is situated in your pelvis. Whole-body muscle use while walking minimizes unnecessary pelvic motion and associated spinal accelerations; in flat-ground walking pelvic motion looks (tracking a dot placed on your CoM) should resemble a flat infinity sign (the exact shape is relative, based on your anthropometric dimensions). TODAY: Sense the shape you leave behind (!) as you walk. It might be an exaggerated figure 8, or maybe the shape is larger on one side, ping-pongs in the middle, or is not infinity-like at all. Ponder how that shape relates to your strengths and physical experience of injury/wellness in related areas. Day 23. WALK NAKED. No, not really. But today, leave any "distraction" device--your music, your phone, your screen, your audiobook--behind. Spend a few minutes with yourself, your thoughts, your body, and your walk. 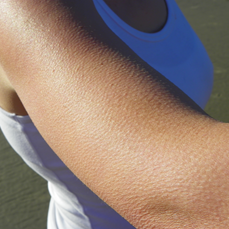 Listen for biophony (natural loads to the ears). Watch the movement of objects as they pass by your eyes. Be present. Participate.